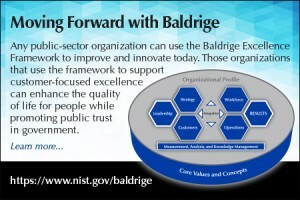 When you hear the word Baldrige, what comes to mind? If you chose one of the first two answers above, you already know two things about one of the most unique—and evolving—programs in the federal government. Changes in the Baldrige Performance Excellence Program (BPEP) over the past decade have given it the capacity to offer U.S. government organizations a promising and proven means of improving performance and achieving customer-focused excellence. The 29-year-old program was named after the late U.S. commerce secretary Malcolm Baldrige. Supported by a unique public-private partnership that includes a nonprofit foundation, the federal program annually trains a large volunteer corps (500-plus in some years) of competitively selected experts in multiple professional fields and sectors throughout the country. Called Baldrige examiners, these volunteers conduct assessments and provide feedback to Baldrige Award applicants to help them improve their performance. Other volunteer experts serve on the Baldrige Program’s panel of judges, reviewing finalists for the annual award in order to help the U.S. secretary of commerce select the recipients. Today, BPEP continues to offer as its key resource the Baldrige Excellence Framework, which includes the Criteria for Performance Excellence and has set the worldwide standard for organizational excellence. The Baldrige framework booklets, available in three sector-specific versions, include a comprehensive and regularly revised set of assessment criteria that enable organizations to assess and improve processes and results using a systems perspective. Adopting this leadership and management framework and using the assessment criteria have helped thousands of U.S. organizations of wide-ranging sectors and sizes improve their performance and support their long-term success. In 2004, congressional legislation authorized the Baldrige Program to expand award eligibility to nonprofit organizations beyond education and health care, including government agencies and subunits. In 2006, NIST’s fiscal year appropriation provided the Baldrige Program with additional funding to move forward with the expansion to fully serve the nonprofit sector. That work included revising the business version of the Criteria for Performance Excellence to make the requirements fully relevant to nonprofit organizations and running a pilot award process in which Baldrige examiners assessed a nonprofit organization. The framework is scalable for use by organizations of any size. Whether one is a small government department or a large agency, an organization can use the resource as a basis for improving the effectiveness and efficiency of its operations as well as develop systematic and innovative processes to strengthen leadership, strategic planning, customers, knowledge management and performance measurement, and workforce engagement. Municipal and state government organizations in states such as California, Florida, Kansas, Tennessee, and Texas have been discovering these benefits over the past decade. Many have received awards from their regional or state-level Baldrige-based programs, and some may eventually apply for the Baldrige Award to receive more feedback on their performance and gain the opportunity to earn national recognition for their achievements. 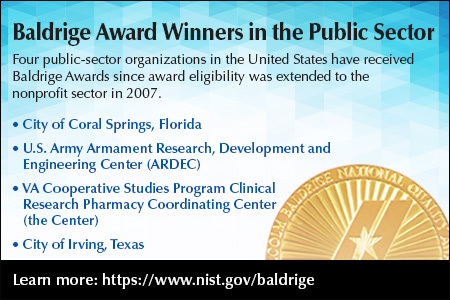 In the meantime, the four government organizations that have earned the Baldrige Award between 2007 and 2015 provide role models for others in the public sector that wish to perform at the highest levels possible to serve residents in every U.S. community.